Do you know Ironsocket.com? Please tell us your experience and write a short review here. IronSocket is a Virtual Private Network provider, which has been offering its VPN services since 2005. Based out of Hong Kong, the service was originally called ‘HideMyNet.com’, but underwent a re-branding process in more recent times, as its product also received an upgrade. In response to the increased awareness of VPNs, which has led to a number of video streaming websites finding ways to block VPN-related traffic, IronSocket decided to develop their own brand of Smart DNS technology. As a result, they have been able to ensure their users are still able to access geo-restricted video content. Smart DNS works by re-routing a user’s DNS queries through the IronSocket servers. The consequence of this is that the user’s true location is disguised. This can then be used to access online content which is only available in certain regions in the world, or to change regions on services like Netflix, increasing the range of content available. Unlike with traditional VPN services, Smart DNS does not negatively impact upon internet speeds, making it perfect for streaming video content. However, internet activity is not encrypted and IP addresses are not changed, meaning that it does not have the full range of VPN security benefits. At present, the IronSocket Smart DNS service is not available as a stand-alone product and can only be purchased as part of a joint package with the VPN service. 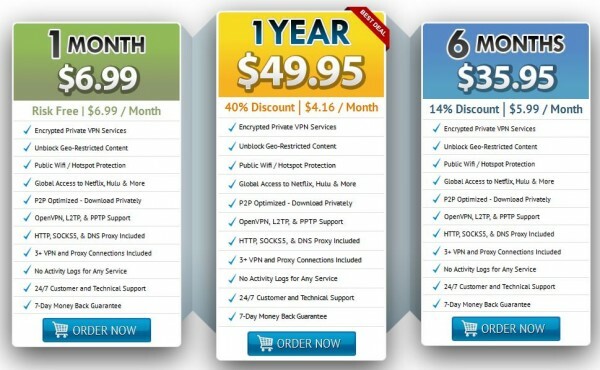 Subscription starts off at a price of $6.99 per month, which is good value, but slightly more expensive than some competitors if customers only want the Smart DNS aspect. That said, long-term subscriptions result in significant savings and users have a choice of committing to either a 6 month or 12 month subscription. The 6 month option comes to a cost of $35.95, which is a 25% saving, while the 12 month option comes to a total of just $49.95, which works out as a 48% saving over the course of the year. At the time of writing, no free trial option is available, but there is a 7 day money back guarantee. In terms of payment methods, a number of different options are available, including credit card, PayPal and even Bitcoin. This range of methods compares favourably to rival products on the Smart DNS market. One potential downside of the IronSocket service is the limited range of customer support options. If users have issues, concerns or questions, they must submit a support ticket and wait for a response. No telephone or live chat options are available, meaning instant support is not available. That said, the response times on the ticketing system are generally very good and knowledgeable staff are able to solve the vast majority of problems swiftly. In addition, the website itself offers a wide range of tutorials, a ‘Getting Started’ guide and includes a Frequently Asked Questions section.